More and more kids are allergic to peanut butter so I didn’t want to risk getting friends sick by making my annual ghost cookies out of Nutter Butter cookies. Instead, I simply replaced Nutter Butter cookies with ghost-shaped sugar cookies the kids helped me bake this year. Allow the kids to help measure, mix, roll the dough, and cut out cookies with you. Older children can help decorate the cookies but don’t let little kids handle the hot melted chocolate. If they don’t like white chocolate you can always frost the cookies with white, vanilla frosting instead. 1. Create sugar cookie dough with a mix from the store. 2. Roll out the dough until it is quite thick — about 1/4 inch to 1/2 inch thick. 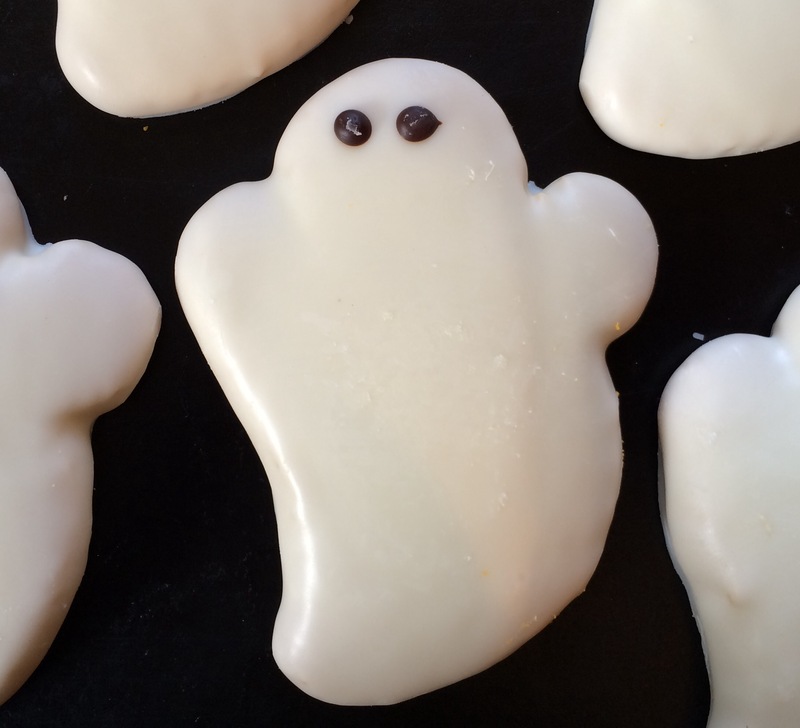 Use a ghost cookie cutter to make ghost-shaped cookies. Place on cookie sheets and bake according to package directions. 3. Once the cookies have been baked and cooled, slowly melt white chocolate chips in a small saucepan, stirring constantly until smooth. 4. Line cookie sheets with waxed paper. Holding cookie with tongs, dip entire top and side of each cookie into melted coating, letting excess drip off. Lay flat, coated side up, on waxed paper-lined cookie sheets. Place 2 mini chocolate chips in coating to form eyes. Let stand about 10 minutes until set. « Mr. Milker: Helpful or Hype?